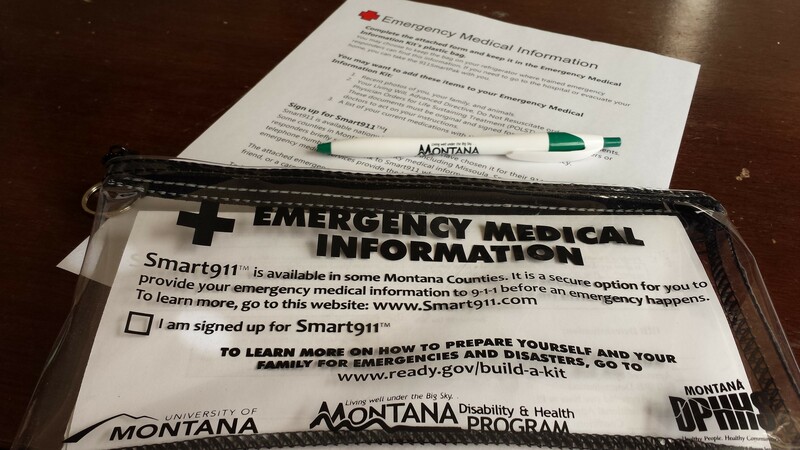 Montana Disability and Health program has created an Emergency Medical Information Kit to improve communications about medical and functional needs during an emergency. The kit also promotes awareness of Smart911 and offers support for people with disabilities that may need help creating their profiles; as well as provide information about available emergency preparedness materials. The kit materials include a plastic bag, an Emergency Medical Information form, and a magnetic hook. Complete the form and keep it in the Emergency Medical Information Kit’s plastic bag. You may choose to keep the bag on your refrigerator where trained emergency responders can find this information. If you need to go to the hospital or evacuate your home, you can take the Emergency Medical Information Kit with you. Recent photos of you, your family, and animals. Your Living Will, Advanced Directive, Do Not Resuscitate orders (DNR), Physician Orders for Life Sustaining Treatment (POLST), or similar documents. These documents must be original and signed for emergency responders or doctors to act on your instructions. A list of your current medications with the name of your pharmacy. Smart911 is available nationwide in towns that have chosen it for their 911 centers. Some counties in Montana use Smart911, including Missoula and Butte-Silver Bow counties. Smart911 lets emergency responders briefly see your emergency medical information when you call from a telephone number that you link to Smart911 when you set up an account. This helps emergency medical services provide the best care for you. The attached emergency medical information form was prepared by Smart911. You, a friend, or a care giver can use this information to make signing up for Smart911 easy. For additional information about registries, visit the Emergency Registries for People with Access and Functional Needs website. The author, June Isaacson Kailes, continues to work with MTDH on various activities that include emergency preparedness. MTDH brought together data from the American Community Survey, Montana Vital Records, Medicaid, Homeless Survey, US Census Small Area Survey, KIDS Count, WIC, and the HCBS Waiver program to provide a comprehensive picture of disability for each state’s county. See the Montana County Profiles. Emergency Medical Information (EMI) kit: This kit was designed to improve communications about medical needs during a disaster. The kit also promotes awareness of Smart911 and offers support for people with disabilities who may need help creating their profiles, as well as provides information about available emergency preparedness materials. The kit materials include an Emergency Medical Information form, a plastic bag to keep the form safe and let responders know the person has signed up for Smart911, and a magnetic hook. Emergency Preparedness: An inclusive Guide for People with Access & Functional Needs Website. You can find more information about F.A.S.T. at this website: http://www.jik.com/disaster-plan.html#Functional_Assessment_Service_Teams. Whole Community Approach – Emergency & Disaster Preparedness. This is an MTDH presentation that can help everyone who provides services and supports to fulfill their role on making sure people with disabilities are well informed and have the resources they need to stay safe during emergencies and disasters. Public Health Data Sets: Several national surveys now contain a set of standard disability questions. States have used these surveys to develop a snapshot of their disability community. Some have even included emergency preparedness question on the Behavioral Risk Factor Surveillance System (BRFSS). Montana Disability and Health program developed a survey to assess shelters’ accessibility and also organized an Emergency Shelter Accessibility Workshop for shelter managers and staff.